In this part you will learn about the basics of game development with PlayBasic. It is not an introduction to BASIC or programming. I assume you have a basic knowledge of programming in any language. I will introduce you to types, images, sprites, the game loop and so on. 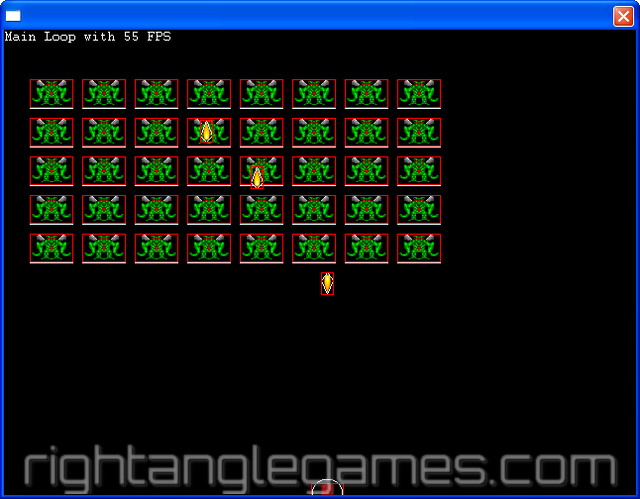 At the end of this tutorial we will have a simple version of Space Invaders running! Update of the Space Invaders tutorial part 1! Just wanted to let you all know that this tutorial is now updated for PlayBasic 1.60 and above, where PlayBasic 1.63 is the current stable release from Underware Design. The tutorial offers now inherited types, pixel perfect collisions, native linked list support and uses collision classes. Read on to learn what great features PlayBasic offers even for this simple tutorial! First we need to define some coding standards or conventions. PlayBasic does not force you to follow given standards but you can or should define your own. The line Explicit True should be put at the beginning of your program. It will help you detect typos in your variable names because it will take care that you define all global, local or static variables before you use them. This is highly recommended and will save you hours of debugging. Promised. Constants are values that never change. You should write them in capital letters (SCREEN_WIDTH, FPS_RATE,...). Globals are values that are valid for the whole program and can be accessed everywhere. To identify them quickly I let all globals start with a capital letter (Score, LifesLeft, IntroRunning). You can also assign new values to Globals, they are not constant. Locals are values that are only valid inside a Function or a PSub which is some special kind of function. They should start with a lowercase letter (index, name$, rate#). PlayBasic knows three base types: Integers, Strings and Floats. Integer identifiers have no trailing character or the '%' sign (lifes, health%). String identifiers must end with the trailing character '$' (name$, HighScoreName$). Float identifiers must end with the trailing character '#' (angle#, speed#). Comments in your source code start with a ';' (semicolon). You can also use the keyword 'Rem' or C style comments like '//' or '/*' and '*/' for multiline comments. Before we start coding it's good to spend some time to think about what we are going to program. all "game entities" like ship, aliens and bullets will be represented by sprites, which are based on images that we will load on startup. That's pretty much it for the start. In our first approach we will start directly with the game (no intro, no menu) and pressing 'Esc' will terminate the game immediately. Sound and music are also tasks for later tutorial parts. Let's start coding with a simple "framework" for a game and work through it line by line (or sometimes in bigger steps if possible). #Abort "This Program Requires PlayBasic V1.60 or above"
Text 100,100,"Main Loop with " + Str$(RealFPS) + " FPS"
The template begins with some version checking code. The commands all start with a "#" sign which means they are Compiler directives. So the source code won't even compile if your PlayBasic version is less than 1.60 in our example. This is good behavior to guarantee your source code snippets will work on other users' PlayBasic as long as they have the minimum required version of PlayBasic installed. Afterwards we start "the real code" by defining a few constants, for the screen size and color depth and for the FPS rate. Also we define two constants to specify windowed mode or fullscreen mode. Then we define two global variables. One for the camera we use (read the section about cameras in PlayBasic's online help) and one global to store the current real frame rate. After the comment "THE GAME STARTS HERE" the main code begins. We set the game to a fixed frame rate of 60 (FPS_RATE) and create a game window of 640 x 480 with a color depth of 16 in windowed mode. Setting the ScreenVSync to true will synchronize the screen refresh with the monitor refreshs which gives a smooth refreshing. This only takes effect in fullscreen mode. We then create a camera. And then we're already in the main loop. The main loop will change later on while we progress in game coding. PlayBasic uses the 'Esc' key as the default break key which terminates your game immediately. So we don't need to add special code right now to leave this endless main loop. In the main loop we retrieve the current frame rate and store it in our global variable RealFPS. Then we direct all following drawing commands to the scene which will be displayed later on by the camera. We clear the screen each frame. Then we call UpdateGame() which will contain the whole game code when we're done with this tutorial. So it will contain update logic and drawing code. After UpdateGame() is done we draw all that can be seen by our GameCamera and sync. Sync means we flush the output and wait the necessary time to keep our set frame rate of 60. And then the loop is done. Now let's enter the player code. We start with intoducing a type. A type is nothing more but a structure to group data that belongs together. You can allocate a single type or an array of types (which we will do later for aliens and bullets). In PlayBasic you can even use type inheritance. This is a proper way to extend base types with additional fields and get specialized types. In our Space Invaders game for example all elements (player, aliens, bullets) have an x and y position, they have a field to store the sprite which is drawn to represent them and they have a status (are they alive or dead). So we will start with a base type TBaseObj and let the further types expand on that type. All inheriting (or child) types can directly use all the fields of their base (or parent) type. In our player type we will store a flag if the player can shoot now. The comments should explain the purpose of the fields. Put both types into your code template in the Types section. Before I forget: add the two constants for the status at the bottom of the Constants section. Let's initialize the player. We need to load an image, create a sprite and fill the player structure with proper values. We stuff all that code into a nice little PSub we call InitPlayer(). Add a line (and a comment line) after creating the camera in the GAME STARTS HERE section. And now to the end of the file to add the new PSub to initialize the player. First we get a free handle for an image. Then we load the image (the zip file at the end of the tutorial contains all sources and images). You can reuse the image to create more than one sprite of it (we will do so when we create the aliens). We center the ship at the bottom of the screen. We create a new Sprite with the ship's image and already place it at the proper position. Sprites are the PlayBasic objects that can be moved, scaled, rotated and can collide with other sprites with collision detection available. We set the drawing mode of the sprite to Rotation(2) and set it's auto centering. This means that the center of the sprite (used for drawing or rotating) is right at the center of the image. We also set a Z position for the sprite which specifies the "depth" at which the player sprite is drawn. Sprites with lower Z positions are drawn below sprites with a higher Z position. Z positions must not be less than zero. Now we store the sprite handle in the Player variable and set the status field to ALIVE. To finally see the player ship on screen we need to add an UpdatePlayer() PSub which will later on also deal with keyboard input and currently only positions the player sprite. Place it after the InitPlayer() Psub. Now we need to modify the UpdateGame() PSub which will first call UpdatePlayer() and then assure that all sprites are drawn on the screen. We use DrawOrderedSprites here to assure that the sprites' Z position is considered. Replace the new code with the old UpdateGame() PSub. If you now start the game you should see your ship sprite at the bottom of the screen. A fixed ship is no fun in a shooter. Let's add some code to get it moving. First we will extend the player type. To check if we collide with the boundaries we need to know the width of the player's ship (or more precisely only half the width). Additionally we need to give the player a moving speed. To allow easy adjustment of the speed while we playtest later on we will make the speed a constant (place it at the end of the other constants). Because the speed is a float constant the name of the constant ends with an "#". I think these simple changes don't need more detailed explanation. We need to initialize the player's variable to store half the width of the image. This will happen in the PSub InitPlayer(). after setting the player's x and y position. But the following code, the modified UpdatePlayer() routine might need some words to help you understand it. Replace your old PSub with this version. This PSub isn't too complicated. We declare two local variables dx# and dy#. Their names tell us that they are float variables and the keyword Local tells us that those two variables are only valid inside this PSub. Outside they are simply nonexistant. We store the original player coordinates in them. Then we check if the left key is pressed. If yes we subtract the speed of the stored player position to move the player a bit to the left. For the right key we do similar stuff except that we add the speed to move the player to the right. Life would be easy if boundaries were not existant. But they are and so we need to check them. We don't want to let the player move off at the left border of the screen. The left most position where we can draw the player ship is Player.wHalf, because we draw the player sprite centered. So we need to check our new calculated position (stored position minus speed) against Player.wHalf. If we are less than Player.wHalf and would leave the visible area we reset the calculated position to Player.wHalf. We also don't want to let the player move off at the right side. The right most position to draw the player's ship is the right screen border (SCREEN_WIDTH) minus half the width of the ship image (remember we use the center of the image for drawing!). So we check dx# against that value and if it is bigger we set it to the right most position. Finally, when we are sure that our calculated position is fine, we assign them back to the player variables Player.x# and Player.y#. The last line places the sprite of the player at the proper position. Remark: You might have noticed that we didn't modify the y position of the player. That's fine for Space Invaders because the player's ship is not able to move up or down. Now give it a run and see if your ship moves left and right. For the aliens we create a new type. It will look similar to the TPlayer type and will also inherit from type TBaseObj. Additionally we will use PlayBasic's native list support to define a list of aliens. Add the type below the TPlayer type just in front of the globals. We will also add two constants. One is to specify the horizontal border which will be used when we have to decide if the aliens move down a bit towards the player. The other one defines the collision mode we use in the game, pixel perfect collision mode. Add it at the end of the other constants. And we will define the global list to store all our aliens. Add the following line at the end of the Globals section. This declares Aliens as a global reference to a list where each element is of type TAlien. Now all we need to code is some initialization stuff to create aliens and some update code to move them (and later on let them shoot and do collision detection). We have to load the image of the alien and later on the image of the bullet too so we better create some globals for all images and add a function to load all images on startup. Place the globals in the globals section. Now let's code the function to load the images on startup. Place this PSub right after the main loop after the comment "THE GAME ENDS HERE, ...". Finally we need to call this function to load the images. Do this before the call of InitPlayer(). Oh, and it's time for the alien image (see it at the end of this paragraph). Again it's in the zip at the end of this tutorial. Let's code the initialization PSubs that will place the aliens on screen. Place the following functions at the end of the file. InitAliens() just uses two nested loops to create 5 rows of 8 aliens. Inside the loops we call AddAlien() to add aliens to the list. The parameters are the global reference to the Aliens list, the x and y indices of the loop and the image to use for the alien. In the PSub AddAlien we do just that: we create a new TAlien object which will be automatically added to the list. We use the name of the list parameter lst to allocate a new TAlien and add it to the list. lst is also used to reference the newly created TAlien object when we want to set the type fields. After creating (and automatically adding) the alien object in PrepareAlien() we first retrieve the width and height of the alien image which we are going to store in each alien. Then we calculate the x and y coordinates on screen for the alien, based on the loop values we got passed in. After storing width and height of the image we create a new sprite for the given image and store the handle of the sprite in our Alien's spriteNo and position the sprite at it's starting position. Additionally we activate the collision mode and set a Z depth for aliens. The value 5 assures that aliens would be drawn above the player ship. Let's add the call to InitAliens() below InitImages() and InitPlayer(). Next thing will be the update routine for the aliens to make them move. Okay - two functions to explain. But first let's introduce some more constants and globals. ALIEN_SPEED contains the speed the aliens move each update. With a speed of 1 and a frame rate of 60 the aliens will move 60 pixel per second. ALIEN_Y_STEP is the y offset that all aliens will move down towards the player ship as soon as one alien touches the border. The second variable AlienMoveDir# contains the current direction and speed of the aliens. If they touch a border we multiply this global with -1 and this way reverse the direction. That's simple. The first variable GameOver describes just what it says: the game is over or not. It's initialized with false. I quickly update the function UpdateGame() to query the GameOver variable and introduce a short PSub UpdateGameOver() that just displays a "game over" text. You'll certainly get that without further explanation. Text 0,0,"Main Loop with " + Str$(RealFPS) + " FPS"
msg$ = "G A M E O V E R"
Okay, but let's have the UpdateAliens() PSub explanation now. First we call a function which will return true if the aliens need to scroll down a bit and change direction and false otherwise. We store the result in dirChange. If we need to change direction we just reverse it (stored in the global variable AlienMoveDir#). Then we loop through all aliens using the marvelous For Each loop to iterate over a list. The name of the current alien is the same as the list name, here Aliens. For the current alien we change it's x position by adding the AlienMoveDir#. If a direction change is required we also increase the y position of our alien. If we detect that the current alien reaches the bottom of the screen we set the global GameOver to true. Finally we call PositionSprite for the current alien with it's updated position to get it drawn at the proper place. The second function DirectionChangeForAliensRequired() isn't difficult. Again we loop through all aliens using the For Each loop. As soon as we find an alien where it's x coordinate leaves the border to the left or the right of the screen we return true. If we don't find an alien that crosses the horizontal borders we return false to tell the calling function that no direction change is required. Before we start to add bullets and collisions I give you all the code in one piece. Just in case you failed to follow my explanations in germish (mixture of english words with german grammar...). This code should be fully functional. If you let it run you can move the ship left and right and the aliens should approach you. If the aliens reach the bottom of the screen the game should display "G A M E O V E R" in the center of the screen. Terminate the game at any time with the "Esc" key. Time to shoot some stuff, eh? Let's add a constant for the bullet speed (at the end of the Constants section). We add a bullet type in the Types section after the TAlien Type. Nothing new here except the field dy# which we will use to implement bullets that can move up (dy# is negative) or down (dy# is positive). The field playerShot is a boolean (true or false) to separate between shots of the player and the aliens. And finally a global list to store all our bullets that are on the screen. This declares Bullets as a global reference to a list where each element is of type TBullet. We need some code to add bullets if the player or aliens fire. So let's create a PSub for it. So what happens in FireBullet()? Input parameters are the global bullet list, x and y position where the bullet should start, also a boolean to indicate if this bullet is fired by the player or an alien. We create some local variables first. Then we create a new bullet. We set the image, depending who shot and set the speed in local variable dy#. The speed is negative for the player because we want the bullet to move up. We then retrieve width and height for the image, similar to the alien's creation routine. We calculate the x# position of the bullet to be exactly in the middle of the passed in parameter x position. We store the height of the image in the bullet. This is used to calculate later on if the bullet left the screen. And again we create a sprite, set collision mode and store it in the Bullet type. We set a Z depth of 15. This value is higher than the player and alien Z depth so the bullets are drawn below the player and alien sprites. Finally we position the bullet on the calculated x# and y# coordinates and set the bullet's status to ALIVE. Of course we need to destroy bullets later on when they leave the screen or when they collide with an alien or the player. The PSub DestroyObject() can be used for Bullets and Aliens because we use the parent type TBaseObj as parameter. We need to release the sprite to avoid ressource leaks. And we assign NULL to our bullet (or alien) to free up the memory and remove it from the native list. That was easy. So let's proceed with the UpdateBullets() PSub. What happens here? Simple, we loop through all of the Bullets, the current bullet is accessible by the name of the list, here Bullets. We move the current bullet in its given direction (either up or down). If the bullet is still visible we position it on its new x# and y# position. To "get rid" of DEAD objects we'll add another PSub to delete all DEAD elements. When we delete a player bullet we reset Player.canShoot to allow the player to fire his next bullet. Now bullets would be drawn and deleted if they were on screen. So let's give the player the chance to fire a shot. If the player presses one of the Ctrl keys he can fire a single shot. Replace this UpdatePlayer() PSub with the old one. at the end of the PSub InitPlayer(). If you now run the game you should be able to shoot single shots. Try it now! Next thing to come will be collisions - hang on! Don't shoot us, we shoot you! Of course it wouldn't be Space Invaders if the player was the only one being able to shoot. So let's teach the aliens! Let's just think about a simple rule of shooting and limitations: for a start there shouldn't be more than 3 bullets from aliens on their way at the same time. They should shoot at random times and any alien should be able to shoot. Let's try to code that. First we need a PSub that counts how many alien bullets are underway. Put this code at the end of the source code. Explanation is pretty easy. We loop through all bullets and search for bullets which are alive and shot by an alien (playerShot = False). We increment alienBullets for each matching bullet. This value is returned as the result of the PSub. Now we need to add some code that randomly decides to add another alien shot if the number of active alien bullets is less than our maximum. Put it behind the other two alien constants, just to keep all alien related constants next to each other. And now let's modify the UpdateAliens() PSub to add the alien's shooting. The code changes were added after the PositionSprite line. So for each active alien we check if a random value between 0 and 100 is bigger than 95. If the number of active alien bullets is less than MAX_ALIEN_BULLETS (3 in our case) we let the alien fire a bullet. The bullet starts in the middle of the alien sprite (which is at x position Aliens.x# + (Aliens.w / 2) and at its bottom (which is at y position Aliens.y# + Aliens.h) . But don't be afraid, they can't harm you right now. But we will change this in a minute. For now start your game and look at them shooting at you! %NOWIKI% Collision detection in PlayBasic is simple. There are some more collision modes but we can ignore them for now. I will use just one of them - the pixel perfect collision mode. Many times you will get along with this collision mode for your games. We already added the constant for the pixel perfect collision mode. You need to set the collision mode for every sprite you'll use in the game. The collision mode needs to be activated for the sprite and afterwards you need to tell PlayBasic which collision mode is to use for this sprite. That means you can have a different collision mode for each sprite! And you can even have sprites that completely ignore collisions with other sprites and aren't checked against collisions at all! We already told PlayBasic to use pixel perfect collision mode for the aliens and the bullets. Let's quickly add it also for the player in PSub InitPlayer(). So what did we add? We switched on sprite collision detection for the sprite and set the mode to pixel perfect. are a very cool feature of PlayBasic. With #IF and #ENDIF you can add code based on compile time expressions. So if at compile time the variable PBDebug is true the following line SpriteCollisionDebug sprite, 1 will be added to the code. If PBDebug is false the line will not be added. And even cooler: If you run the game in debug mode (by hitting 'F7' in the IDE) this boolean variable PBDebug will be set to true automatically. If you run the game in normal mode (by hitting 'F5') the variable PBDebug will be false. And SpriteCollisionDebug enables the drawing of the collision area for the sprite. So you can easily verify if your collision areas are positioned and sized properly. What's left? Oh yes, at the beginning I promised to show you the usage of collision classes which is a very effective way to check collisions by calling the PlayBasic function SpriteHit(). There is another way to check for sprite collisions by calling SpritesOverlap() but this implies some brute force coding on your side by checking each sprite against all the others. Pretty time consuming and slow compared to SpriteHit() which additionally can take advantage of only checking sprites with involved collision classes. So let's setup some collision classes which must be powers of two. Now let's add the collision classes to the sprites where they are created. Add the following line to PSub InitPlayer() behind the line where we set the pixel perfect collision mode. Do the similar thing for the PSub AddAlien(). Place the following line behind the line where we set the pixel perfect collision mode for the alien sprites. In the PSub FireBullet() add the following lines behind the line where the collision mode is set for the bullet sprites. We need to separate if the bullet is a player bullet or an alien bullet. Where's my sprite? Where's my type? Am I alive? but there's no way back from sprite to type! But have no fear - the solution is near! Luckily PlayBasic offers a feature called SpriteLocals. This allows us to store additional user data in a memory area attached to the sprite. We will use this to store the type pointer into each sprite's "personal" memory area. We need to do this for the bullets and the aliens, so let's go! Looking at the PSubs InitPlayer(), AddAlien() and FireBullet() you will detect that much of the code to setup and prepare the sprites is identical. So let's extract or refactor that into a new PSub MakeSprite(). The PSub already contains the code to set the SpriteLocal and to apply the depth to the sprites. And because we based the alien and bullet types on the same TBaseObj we can reuse the function GetObjectPtr() for both lists. We do not need to take care of the allocated memory when we destroy a sprite because that happens automagically inside PlayBasic. That's great, isn't it?! We also added a line to all PSubs to set the status of player, aliens and bullets to ALIVE. When we check for collisions later on it is easier to just mark bullets and aliens as destroyed/DEAD while we walk through the lists instead of deleting them immediately. Did you bump into me? Now that we prepared collision detection we should use it. Are you ready? Let's go! First let's start with the player and alien ships or alien bullets. We'll check that in the UpdatePlayer() as we only need one call to SpriteHit() in this case because we can combine collision classes and check for collisions with any alien or alien bullet. I added the collision check at the end of the PSub. As soon as the player sprite hits any alien sprite or alien bullet sprite we set GameOver to true. That's pretty simple and straightforward, right? Now for the player bullets: We need to check collisions of player bullets and aliens (leading to the death of the aliens). We put the code into the UpdateBullets() Psub cause that is the place where we mainly deal with the bullets. I think some little code explanation is recommended. First I changed the condition inside the For Each loop: we only look at bullets that are ALIVE. DEAD bullets are not treated here. The new code starts in the Else section where the comment mentions bullet collisions. We need to check if the bullet is a player bullet and collided with an alien. For that we need to call SpriteHit() and use the ALIEN_COLLISION_CLASS. If we hit an alien (alienSprite > 0) we retrieve the pointer to the alien type and set the status of the alien and the bullet to DEAD. We continue the loop as we don't want to deal with this dead bullet anymore. Finally we assure that the bullet is drawn if it is still alive. Oh, and of course we need to call the Psub DestroyObject() to remove the dead aliens from screen. We will do this in the PSub ClearDeadObjects(). Here's the updated code of ClearDeadObjects(). And finally I modified the PSub UpdateAliens() to only deal with alive aliens. And that's it. Have a play for a while and don't get shot. Did you play your game? Was it too fast? I think so. Let's decrease the speed of the aliens. Aah, better. And see how smart it was to store the alien speed in a constant and use that through all the code? One line changed - big effect achieved. What next? If you shot all the aliens the game does not end but there's nothing left to shoot. Let's add some levels and difficulty. We code that in a minute (or a bit more). We add a global Level and set it to 0. Place the line just before the GameOver global. Now when all aliens are gone we want to recreate them and increase the level. We do that in UpdateAliens(). To get some increase of difficulty we change the game so that the number of alien bullets in game is equal to 3 plus Level. So the higher the level the more bullets the aliens can shoot. This also happens in UpdateAliens(). The changes are minimal. We introduce a new local variable activeAliens. During our update loop we just count the active aliens. If the count is zero the player killed all aliens. So we only need to increase the level and call InitAliens() again to recreate them. Do you see how valuable it is to code Psubs and Functions? If you code them smart you can reuse them many times! For the difficulty increase we had to change just one line. Now the higher the level the more they shoot. Finally let's add some scoring. We introduce two more globals, a score and a high score. Let's also reset the level and score to 0 if we initialize the player. at the end of Psub InitPlayer(). Now for each destroyed alien let's increase the score by some value. The standard alien killer score will be 100 and of course become a constant. Put this line at the end of the other alien constants. We increase the score when we know that the alien was killed by a player bullet in UpdateBullets(). Now let's update the UpdateGame() Psub to see the score so far. Text 0,0,Str$(RealFPS) + " FPS"
So just some text printing added. Simple. Finally we want to check if we got a new high score and restart the game if necessary. UpdateGameOver() is our friend here. So we simply added a little text output and setting an updated highscore if required. I added a simple PSub DrawCenteredText() to simplify placing some text horizontally centered on screen as we need multiple text lines now. We also added a restart option if the space key is pressed. To enable that it was necessary to add some cleanup functions which mainly hide the sprites that are still on screen and set the status to DEAD. Cleanup happens in the ClearDeadObjects() PSub. Afterwards it's just calling InitPlayer() and InitAliens() again to have some more fun. Here comes the code for the hiding Psubs. No big deal there so I just dump the code. That was it. A simple Space Invaders game in one go. It's done so get the updated source code of it here! Feedback via email or in the Underware Design thread of the tutorial here.